Who said that Christmas shopping is stressful? If you’re in New York for the holidays, you’re in luck: annual holiday markets offer an opportunity to mix sightseeing with shopping duties and fun winter activities. Head to any (or all) of these seasonal markets to find that one-of-a-kind gift or simply get into a Christmas mood. 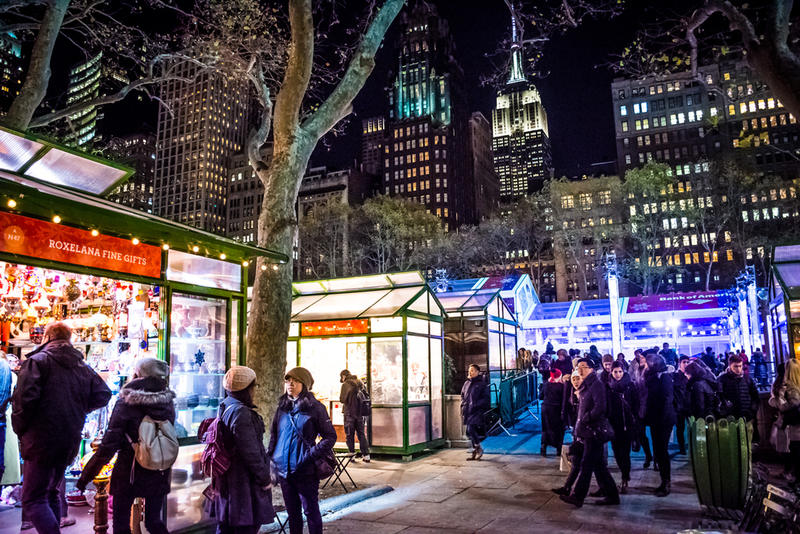 Packed in the heart of Midtown, Bryant Park becomes a full Winter Village during the holiday season. It has the only free ice-skating rink in New York, the seasonal Public Fare restaurant and over 150 independent vendors selling anything from original artwork to gourmet cuisine and elegant ornaments. Walk for 10 minutes down 7th Avenue and turn left at 42nd St. This indoor holiday market is located in the heart of Grand Central Terminal. During the holidays, Vanderbilt Hall becomes a beautiful mall housing an expertly curated selection of artisans. Are you looking for the perfect Christmas gift? Take your time to peruse - there’s something for everyone. Walk for 15 minutes to 42nd St and the corner of Park Avenue. If you’re heading to Central Park, take a short detour and explore the holiday market at Columbus Circle. Although it’s located in an area with high international tourist traffic, the market focuses on showcasing local products. You’ll also find organic food and eco-friendly gifts. Take a 10-minute walk along Broadway to Columbus Circle. We all have that quirky yet lovable relative - if you’re shopping for them, head to Union Square Park. Here you’ll find over 200 vendors selling a very complete collection of eclectic goodies that you won’t find anywhere else. Local crafts and out-of-the-ordinary products are the highlight of the market. Now that you know where to shop for holiday gifts, it’s time to book your at the Manhattan at Times Square. Stay in the heart of New York and take advantage of our unmatched special offers.